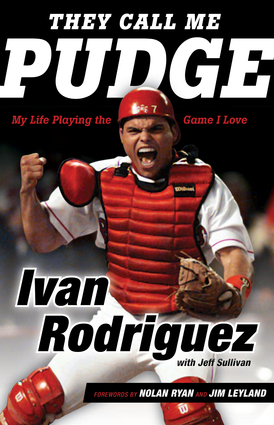 Ivan “Pudge” Rodriguez won just about everything someone could win in baseball during his wildly successful 20-year career. As a World Series Champion, American League MVP, 14-time all-star, 13-time Gold Glove winner and now Hall-of-Famer, Pudge didn’t simply play baseball; he lived it, working every single day to be the best player he could be. In They Call Me Pudge, Rodriguez tells the story of his unforgettable baseball journey, from signing his first professional contract as a 16 year-old in Puerto Rico, to his years in Texas, Detroit and beyond, to the World Series stage in Miami and behind the doors of the Texas Rangers front office. Rodriguez's accomplishments, his teammates and his biggest challenges all receive time in the spotlight in this refreshing memoir of a life and Hall-of-Fame career. Ivan “Pudge” Rodriguez played for the Texas Rangers, Florida Marlins, Detroit Tigers, New York Yankees, Houston Astros, and Washington Nationals during his 20-year Hall-of-Fame playing career. He was born and raised in Vega Baja, Puerto Rico, and he now serves as special assistant to the general manager for the Texas Rangers. He was elected to baseball's Hall of Fame in 2017. Jeff Sullivan is a columnist and feature writer for the Dallas Cowboys as well as the editorial director at Panini America. He lives in Arlington, Texas.